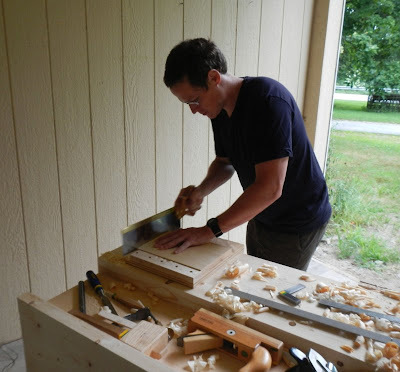 This past Saturday morning I taught the third class at the Close Grain School of Woodworking, covering final stock preparation. This is where you take your rough-cut pieces and size them to precise dimensions. Returning for this class was Reeve Goodenough. It promised to be a hot, hazy, sticky day, so we pulled the bench outside to the entryway. Reeve flattens the face of a board with a #7 jointer. The #4 smoother and #5 jack are in the tool well; the two lengths of aluminum angle iron on the benchtop make great winding sticks. The sequence I follow is known as FEWTEL: Face, Edge, Width, Thickness, End, Length. You first establish the Face and adjacent square Edge, which then serve as reference surfaces for all other operations. The Face, Edge, and End are all at whatever starting point is convenient on the board, but once they're established, the Width, Thickness, and Length then need to be at specific distances from them. Where rough stock preparation only requires loose tolerances, to within 1/4" or 1/2" and a degree or two of square, this is where you can unleash your obsessive side. Now we're working to within 1/64", 1/128", even 1/1000" tolerances, and angles measured to 1/10 of a degree. The precision weapons that allow you to achieve this are hand planes and shooting boards. Since most rulers are marked down to 1/32", you can approximate 1/64" and 1/128" by halving and quartering the divisions by eye. The jointer and smoothing planes then take shavings down near 1 or 2 thousandths. That means you can establish flat faces and edges to within less than the thickness of a piece of paper (by my dial caliper, 5 sheets of printer paper are just over 1/100"). You can fine tune width, thickness, and length to the same degree. And if you need to remove a fraction of a degree off an angle, you can. Of course, achieving high precision requires practice with the tools, which must be well-tuned. Work to the precision your current skill level allows, and tighten the margins as your skill improves. Eventually you'll reach the practical limits of the tools and the materials. There's still a place for rough steps, even here. Having established the Face and Edge of a board, you may need to remove a bit of material to reduce it to proper width and thickness. 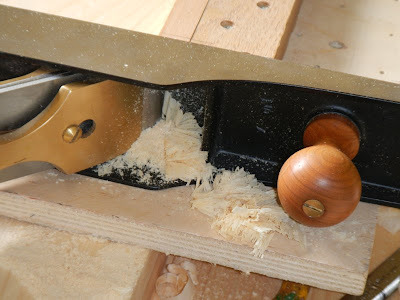 The initial material removal can be done with scrub or jack plane, taking thick, heavy shavings, more like chips. It's not unreasonable to remove up to half an inch of width, or a quarter inch of thickness. It may take a few passes, but once the parts have been broken down to rough size, these reductions are quick. Then the finer planes finish them to precise size. Similarly, excess length can be sawn off quickly, to be shot precisely on the shooting board. For this class, I had Reeve start with a moderate-size piece of rough stock, such as might be used for a jewelry box lid. 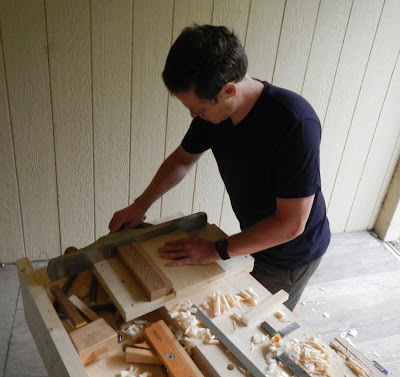 After going over some options for work-holding and reviewing the order in which the various planes are used (scrub if needed, then jack, jointer, and smoother), I took him through the FEWTEL sequence, dressing the board to smooth surfaces and square all around. This size board is easy to work with, so is good for starting out. 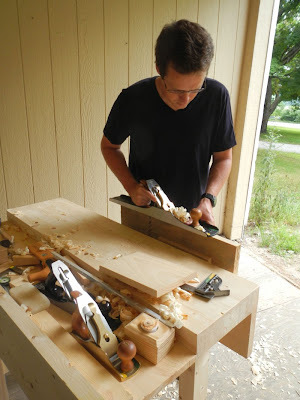 Larger boards and very small ones can add complications, as you try to cover the length with the plane, or find a good way to hold the work steady. He also had some questions about tapering, so we went over that. Sawing to length on the bench hook, cutting just to the waste side of the line. That's a wooden scrub plane lying on it side in the well. Using the #7 on the shooting board to precisely square up the sawn end and shave it down exactly to the line. This is what I mean by fine-tuning. Look at those end-grain shavings from shooting! After he had practiced with that piece, I gave him a bigger piece, so he could work on body mechanics over a larger length and area. Reeve joints the edge of the longer piece. 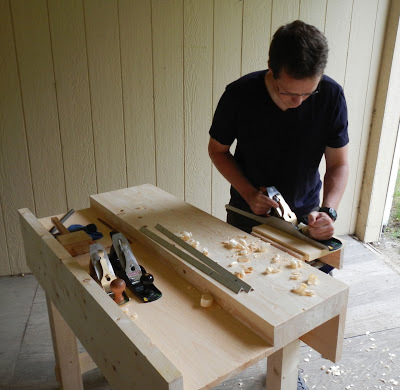 The next class in the series will be simple joinery, such as half-laps and dadoes. If you're interested in taking a class, you can sign up for one of the pre-scheduled group classes, or schedule a private class.